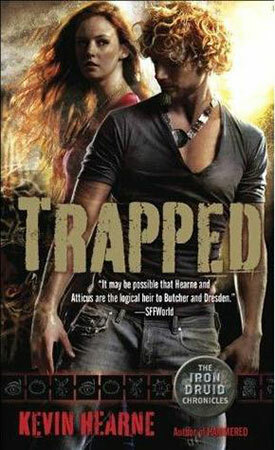 Trapped is the third of Hearneâ€™s Iron Druid series, featuring the adventures of the worldâ€™s last druid, Atticus Oâ€™Sullivan, his apprentice Granuaile and his Irish wolfhound Oberon. Having faked his own death, Atticus has been secretly training his apprentice for twelve years, and is now ready to bind her to the earth, thereby making her a full druid.Â However, the sudden appearance of Loki and his faked death becoming widely known among the gods and faerie folk means that this suddenly becomes a lot more difficult than he would like. With gods, dark elves and vampires out to kill them, they must use all of their wits and skills to survive long enough to bind Granuaile to the earth and defeat their opponents. An interesting mixture of folklore â€“ Roman and Norse gods are mixed with vampires, dark elves and the Gaelic faerie folks, but one that is used to good effect. Atticus is a typically flawed but good-intentioned lead character, who has been compared (not unfairly) to Harry Dresden by many. Hearne crafts a gripping tale, and each book stands alone, and also as part of the overarching storylines.